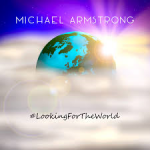 Share the post "Album review: MICHAEL ARMSTRONG – #LookingForTheWorld"
Michael Armstrong introduces his new album (27:44) This showcase was first broadcast on Get Ready to ROCK! Radio in the ‘New to GRTR!’ sequence. Second album by Michael Armstrong, one that has been in the making during the past couple of years and the aim was to make an album ‘liked they used to’. Michael Armstrong also wanted to pay tribute to his musical influences which include the Beatles, Supertramp, ELO, Billy Joel and Pink Floyd. Joining him as his main musical companion is Warren Bennett, who co-produced the album with Michael and co-wrote many songs on the album. Lyrically it pulls no punches as can be heard on ‘Too Many Cars’, looking at our overcrowded world wrapped in a sweet melody and featuring one of the many exquisite sax solos from Ed Barker. Melody is the one thing this album has in abundance, be it the ELO sounding ‘Doin’ The Time’ (a single if such a thing had a chance of being a hit nowadays!) or the Tom Petty & The Heartbreakers-meets-TheBeatles flavoured ‘She’s All Kooky’ – loving the guitar playing on this one. It is an album that despite its modern production, wouldn’t look out of place had it been released in the 70′s. Heck ‘Periscope’ could be Supertramp in their 70′s pomp, from the keyboards riff and the clever use of harmony vocals. Steely Dan guitarist Elliott Randall guests again on ‘Those Shoes’, which not surprisingly has hints of Steely Dan with its jazzy feel. As the old saying goes ‘they don’t make them like they used to’, well Michael Armstrong refutes that on this album. This entry was posted in ALBUM REVIEWS, ALBUM REVIEWS (Mobile), All Posts and tagged #LookingForTheWorld, album, Elliott Randall, Jeff Lynne, melodic, Michael Armstrong, pop, review, rock, Steely Dan, Streely Dan, Supertramp, Warren Bennett. Bookmark the permalink.